Not the nastiest of the leaf problems, foliar nematodes are without a doubt the most difficult to control and probably impossible to eliminate. They are tiny wormlike things that get into the leaves and begin sucking cells dry, eventually causing dead areas between veins. They reproduce like crazy and a single leaf could have thousands. 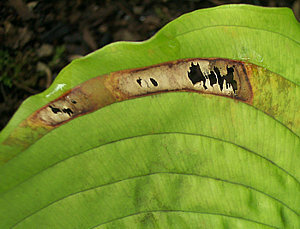 When the leaf surface is wet some come out and are washed off and spread to other plants. They overwinter in dead leaves, the soil, and behind the dormant buds of hostas. They also infest many other plants like ferns, heucheras, coneflowers, rudbeckias, various weeds and even grasses. By the end of the summer a garden could have millions. Checking for nematode presence can be done with a cut-up leaf in water in a clear dish with a 5x magnifying glass and bright light. There isn't a lot that can be done to control them. The chemicals that once worked were not for residential use and have mostly been banned anyway. One that is effective, though very expensive, is Pylon. Unfortunately it is not allowed for outdoor use. It can be used in greenhouses or even taking plants into a garage for cleanup. Three applications two weeks apart are necessary covering the leaves completely. After Pylon, only contact-kill products are available - nothing else can kill them in the plant. Strong hydrogen peroxide sold as Zerotol works well, as does insecticidal soap. Drenching and spraying with these as the plants begin to unfurl can greatly reduce nematode damage. More information on foliar nematodes can be found HERE. In the Garden: Pylon (indoors), Zerotol, Insecticidal Soap sprayed early and repeated several times in the first 6 weeks after emergence offers some control. In the Nursery: If allowed, Vydate offers the best control. Spraying or dipping with Pylon can clean up plants, and potting soil and all surfaces can be cleaned with Zerotol. Note: There is a bacterial leaf disease that causes very similar symptoms. It is difficult to tell which is which just from visual examination. Treatment is different for the two problems. Article HERE.